I started throwing in grade eight a few days before our district meet. I won our district meet and I was scooped up by Tammy Gaudet from Bluenose Athletics who convinced me to come train with the club. I can say that I’ve truly grown to love throwing—training, lifting and all its glory. I stuck with it because I had a coach behind me that saw that I had a future in it and helped me get through every step of the process that has lead me to where I am today. From 2010 through to 2013, you competed at four consecutive Canadian Legion Track & Field Championships, culminating in a silver medal performance in the shot put at the 2011 championships. Take us through your years in the Legion program. How did the program help you go from a middle of the pack competitor to one of Canada’s best? The Legion program provides young athletes an opportunity to explore track and field and gain experience at a young age. I was lucky enough to have been a part of the Nova Scotia team for four years. Whether it was an eighteen-hour trek to Ottawa on a bus full of people, not making the finals, being away from home, or learning how to compete, these are valuable experiences that introduce young athletes to the world of track and field. Furthermore, the friendships and connections you make really help push you forward and gives young athletes a chance to work toward their goals. After years of throwing you took a bit of a break and tried out the heptathlon in 2013, scoring a best of 3744 to finish 7that your final Canadian Legion Track & Field Championships. What made you interested in trying out the multi-event? I was always an athletic kid growing up and through high school, despite focusing on throwing, I played almost every sport offered at my school but always took part in other events during the high school track season. That year at our district meet I jumped 5.20m in long jump, did well in hurdles and a few other events and the coaches at Bluenose Athletics (Tanya Daniels/Tammy Gaudet) and I figured we’d give it a try. I trained for the hep until Nova Scotia legion trials, snagged myself a spot on the team, and ended up placing 7that the Championships—that was the end of my multi career given that my shot put result from the heptathlon would have won me a medal in individual shot. In 2015 you were named to Team Canada for the Pan American Junior Athletics Championships, where you finished 4thin the shot put with a personal best throw of 14.57m. How was your first national team experience? In 2015, the Pan American games were being held in Alberta (the same location as nationals). I feel like this was truly an experience. I can honestly say I’ve never been so excited and so nervous at the same time. I was ranked quite a bit lower entering the competition, but I was very focused on just throwing my best because that’s what I was there to do. I believe being on a junior national team helped better prepare me for what to expect on the senior international stage. At the 2017 Canada Games, you won Nova Scotia’s only medal in able-bodied athletics, capturing gold in the shot put with a best throw of 15.61m. Take us through your Canada Games experience. How did it feel to top the podium for your home province? Being able to compete at the Canada Games was an incredible experience for me personally as I had the opportunity to share it with two special coaches, Tammy Gaudet and Nicole Larade. After Legions, Canada Games is the last time an athlete is eligible to compete representing their province. The Games were important for me because I wouldn’t have experienced any of the opportunities I have without the support from everyone in the athletic community in Nova Scotia. I felt like I was throwing for everyone back home, not myself. 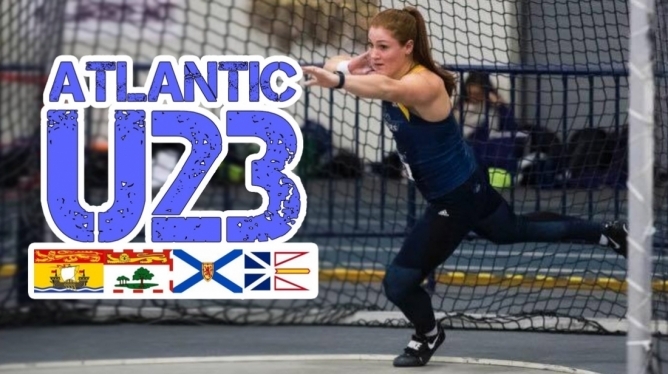 Shortly after competing at the Canada Games, you flew to Taiwan to represent Canada at the Summer Universiade (FISU), where you finished 10thin the shot put with a personal best throw of 16.32m. Take us through your FISU experience. To date, FISU was one of the best experiences of my track and field career. It was an eye opener for myself as to what was to come. Travelling to compete against some of the best in the world, I got to experience everything from jetlag to the hot, humid climate of Taiwan in August and my first ever crack at qualifying rounds. Top twelve athletes from the qualifying rounds moved onto the finals a few days later. The night of the final, I remember walking into an electric stadium. The stadium felt like it was vibrating because the crowd was so loud, which hyped me up. I threw my personal best on my third throw in attempt to grab a spot in the top eight but unfortunately two other girls out-threw me on their final attempt and I finished 10thoverall (after being ranked 15thcoming into the event). How did your second Team Canada experience compare to your first? My experience at the World University Games was a completely different experience than my experience at Panam Juniors. Having an extra two years of experience under my belt, training full time all summer, and having higher expectation, I was far more prepared to compete. At the 2018 U SPORTS awards banquet, you received the Women’s Athlete of the Year (Field Events) Award, while fellow Nova Scotian Beth Lawrence received the women’s Student Athlete Community Service Award. How did it feel to be the recipient of a U SPORTS award? Incredible. At the beginning of the season my coaches and I made the decision to use this year to change my throwing technique from the glide to the spin. Coming into the season I had to try and keep my expectations realistic but as the season moved forward things really started to come together. I threw a personal best of 16.53m in mid-November just under two months after switching techniques. My time as a Lancer has been a huge part of my athletic career and it was an honour to be recognized as the U SPORTS Women’s Field Athlete of the Year in my final season as a Lancer athlete. At the 2018 U SPORTS Track & Field Championships, you won silver in the weight throw with a best attempt of 17.79m, and gold in the shot put with a best attempt of 15.09m, despite four faults and throws well short of your 16.82m personal best. Take us through competition day at the championships. I went into the shot final very confident and excited to compete. U SPORTS were in Windsor, my home track for the past four years, and the women’s team was on track to have our best finish since I’d been on the team. I had a great warm up, but my throws were just a bit out of control. I secured my spot in the final by doing a standing throw on my third attempt which put me in first place and during the last three throws I managed to save one throw of 15.09m. Despite being well over a meter off my personal best, the four throws that I fouled were some of my best throws and a sign of bigger throws to come in the future. What are your plans now that you’ve graduated from University of Windsor? Do you intend to stay and train in Windsor or locate elsewhere? Toronto. I have relocated to train with a group of throwers at the High Performance Center and to continue being coached by Rich Parkinson. Though certainly finding your niche in the shot put, you have had great success in the weight throw. Where do you see the weight and hammer throw events in your future? I started weight throw during my first season at Windsor. Having never done hammer before, it was a huge learning curve but I continued with it because it is the only other indoor throwing event, and for team points (of course!). Last year, I started to learn some hammer and ended my season with just under a 50m throw. As for the future, I am not sure what it’ll bring. What are your plans for the upcoming outdoor season? The beginning of the outdoor season will consist of mostly training and preparing for nationals, while the second half of the season I will be heading to Europe to get some more international experience at some higher-level competitions as a part of the NextGen European Tour. Scuba diving. I started when I was around twelve years old and it’s just something I’ve fallen in love with.